This page contains a guide on the TV Video Game Mini-Game, including how to play, what to obtain, and rewards. We will be updating this as we go along. This page contains a guide on the TV Video Game Mini-Game, including how to play, what to obtain, and rewards. 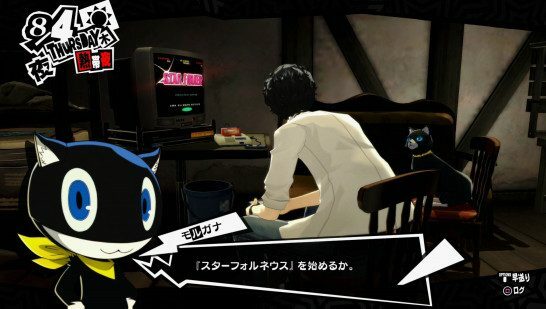 This article contains information on the TV Video Game Mini-Game in Persona 5. It includes how to play, the Game Titles, the Mechanics, and the Rewards obtained for finishing the Video Game. In order to unlock the TV Video Game mini-game, you have to purchase a TV from the recycle shop in Yongen-Jaya Backstreets. After purchasing the TV, the player will eventually be able to purchase a games console from the shop. Its stock is random, so check back regularly. If you read the Book Gēmu ōwaza Izumi*, you will unlock the “back” technique. This lowers the difficulty lower for the title of the game you are currently playing. It is recommended to read this book if you want to obtain the Trophy. During your Free Time, stay inside your room in the evening in order to play some video games. You can find games in the Akihabara Retro Game Shop and the Yongen-Jaya Recycle Shop. Finishing the game a total number of times will reward you with Social Stats. The number of times you have to finish the game depends on the title played. Comes bundled with the Retro Game Set, Star Forneus 1988 is one of the first games with a simple mechanic. The goal is to defeat the boss within the time limit. To play, press the ○ button rapidly. You have to press the button the required number of times (25) before time runs out to successfully complete the gaame. You have to pay 5,200 to purchase Hatredo Goemon. To start, the dealer will ask you whether you want odd or even. After selecting the die, the dealer will shake it using the ○ button. If the die rolls to as you selected, you win the game. The game costs 5,300 yen. In order to clear this game, you have to input the specified button before the time expires. The game costs 5,600 yen. To start the board game, you need to input ○ to roll the die. The player moves a number of spaces depending on their roll. Released on 10/1, this game plays similar to Punch de Ouch. It costs 5,500 yen to purchase. Another game released on 10/1, it is the least expensive Akihabara Retro Game. Tap the ○ button to commence the game. Similar to the Fishing game, press the ○ button to stop the cursor. The goal is to stop it when it reaches the yellow bar.